We then got a much deeper appreciation for Stana Katic’s popularity and learned much more about her legion of “Stanatics.” Our webiste traffic spiked. Emails poured in. And Stanatics were retweeting the story. She agreed, of course, and we had more than 200 questions in no time. Stana couldn’t answer each Tweet, so she tried to answer the most common questions. We’ve provided five questions with Stana’s answers below and we will post another five Q&As tomorrow. Then on Friday, you’ll see another TV Weekly cover which includes Stana. My question for Stana Katic: what’s her favourite book? Stana: Too many to choose: The Master & Margarita, Zorba the Greek, Slim, Crime & Punishment, Anna Karenina, The Giving Tree, The Teachings of Don Juan: A Yaqui Way of Knowledge, Middlesex, Hell’s Angels … the list goes on… and on. Ask Stana Katic: if she had her choice, where she would want the Caskett wedding to be held. Stana: Space. That way it’ll have gravity to it. To Stana: Which is the last funniest thing you remember from the set of Castle? Stana: Overall, there’s a sweet camaraderie on this set. So, there’s always teasing & having fun. These people have become a family to me after this many years & this much time together. Stana: Madonna’s Immaculate Collection… I may or may not have taught my little brothers how to Vogue. 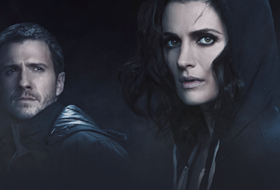 My question for Stana Katic: whats your favourite episode from castle so far? Stana: The producers have electric shock nodes attached to my face to make it do what they want. Stana: I try to. My fans are great. They’re this odd mix of poets, outlaws, travelers & teachers. I am incredibly grateful for them. 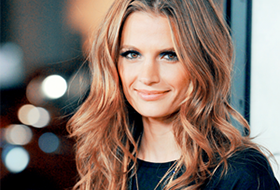 Qs for Stana: what/who has inspired her in her life? Fav ice cream? She works long hours, who reminds her to eat? 😉 thanks! Stana: Children. They haven’t forgotten how to dream. And the elderly. They got the best stories. What is the best & the worst of being famous? Stana: First of all, thank you. I’m not sure I would call myself “famous”. But I guess I have enough of a voice that charities & issues that I care about can have a wider reach through me. I’m very lucky to be where I am, doing what I do. There is no downside to that. Additional questions added April 4 (these three questions were from the editors of TV Weekly). TV Weekly: You’re at a magazine rack and can only pick three titles. Which ones do you choose? Stana: Scientific American, National Geographic and Conde Nast Traveler. TV Weekly: If your TV carried just three shows or networks, what would they be? TV Weekly: What are three things you have to have in your fridge or pantry? Stana: Water, lemons and ice.